Ryanland is a story of one man's quest to explore the charms of low-cost flying. Philip Nolan travelled everywhere the Ryanair budget airline would take him (at the time of writing) and turned his experiences into an amusing travel memoir. Whatever else can be said about Ryanair, it sure as hell is cheap. Nolan's odyssey, consisting of 61 flights, set him back by 2,064.29 euro. He visited 18 countries (if my calculations are correct), staying in quality hotels, sampling local cuisine and visiting Irish pubs. The book is undeniably funny. At times I laughed despite myself, and felt guilty afterwards - Nolan's sense of humour is not exactly of the noblest kind. At least his writing skills are up to scratch. Let's be frank: airport-pub-hotel-airport routine is not a good example of adventure travel and turning it into a readable story required talent. Speaking of finance, Dervla Murphy would probably travel halfway through the world on what Nolan spends on food and accommodation during one evening. Budget travel? I don't think so. Not with hotel bills averaging over 100 euro, with high points of almost three times as much. My goodness, I'd rather sleep rough for a week than pay three hundred quid for a room! 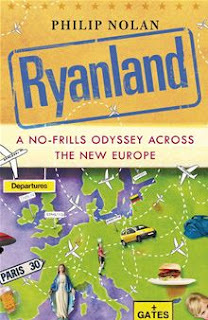 Then again, Ryanland was definitely not written for the likes of me, no matter how many air miles I have clocked with the infamous airline. Frequent references to tabloid celebrities would suggest that Nolan's target audience are people who, to use the author's own words, 'are just a tad more preoccupied with Manchester United, getting laid and figuring out ways to buy a 50-inch plasma telly'. Somehow I'm proud of NOT belonging to this group.